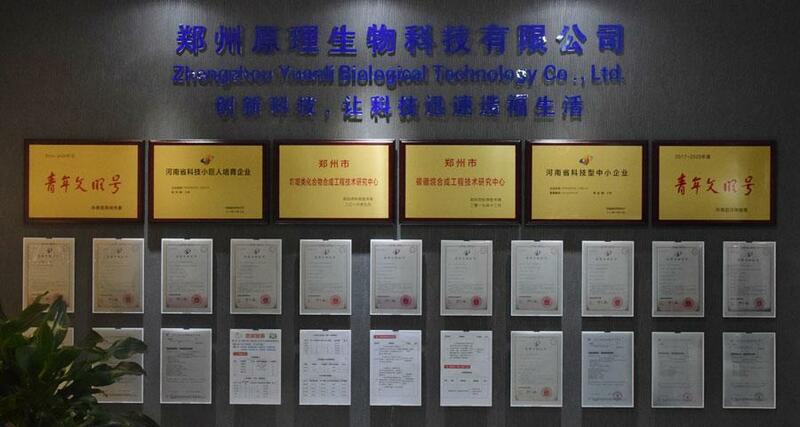 In 2018, the first batch of “national high-tech enterprises” have passed the certification. In 2017, the state-level science and technology small and medium-sized enterprises were awarded the “Ninth Henan Innovation and Entrepreneurship Excellence Enterprise Award” and the “Zhengzhou Carborane Synthesis Engineering Technology Research Center” was established. In 2016, it was recognized as a scientific and technological small and medium-sized enterprise in Henan Province. It was awarded the title of “Henan Province Science and Technology Little Giant Cultivation Enterprise” and the national “four-up” enterprise and was awarded the “Zhengzhou Acridine Compound Synthesis Engineering Technology Research Center”. In 2015, it was included in the sixth batch of innovative pilot enterprises in Zhengzhou. In 2014, it was recognized as a SME in Zhengzhou City. They were awarded the honors of “Henan Provincial Youth Civilization”, “Zhengzhou Youth Civilization” and “High-tech Zone Youth Civilization”. The company pays attention to the protection of intellectual property rights, applies for 17 invention patents, has 12 authorized invention patents and 1 registered trademark.